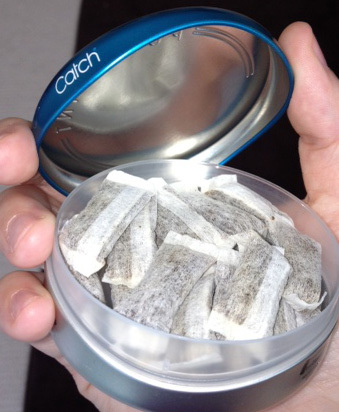 I like to refer to catch as the ‘junk food’ of the snus world. Is it the best flavored snus on the market? No. Is it the best quality tobacco? No. Is it the best nicotine hit for your buck? No. Is it fun and a nasty little treat you can indulge in from time to time? HELL YES! 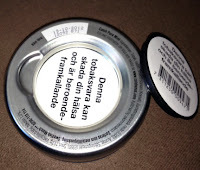 I have been using this snus for years and there are at least 3 qualities I enjoy about it. The first is the tin! OMG this has to be the coolest looking and most functional can on the market! I had to have a long, hard think to myself about the reasons I’ve brought so many cans. Is it for the tobacco or for the can? It’s definitely the can! 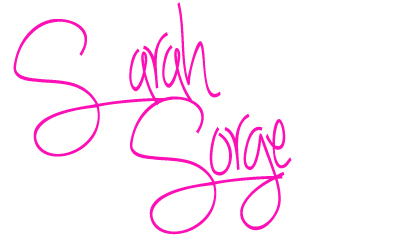 Whoever designed this is pure genius. The colors are really eye catching, its lined with plastic and has a waved locking mechanism which means that you simply have to twist to take off the top. The underneath is also very cleaver (see photo). The used portion tray is pressed into the metal and has a small plastic cap. The use by date is also clearly printed and so are the ingredients. All in all its well-designed and very practical. I love the cans so much that I can’t bare to throw them away. I have many of them around the house and here are some of the things I do with them. I put all my portions in them and throw away the cheap plastic cans. I put jewelry and rings/earrings in them to keep them safe and together in my purse. I Put loose change in them for parking meters and trips to buy stamps. I buy cheaper loose herbs and spices at the market and put them in these tins with a clear label. I put loose gum and mints in them so I can alternate it with my snus so I don’t develop a 2 can a day habit. The second thing I love is the portion shape and size. Somebody at Swedish Match must have broken into my house in the middle of the night and measured my mouth when I was asleep, because these fit like a dream! Its bigger and more substantial than a mini portion, but narrower and longer then a regular portion. They are Puffy and filled with just the right amount of tobacco, its heaven for a small mouthed girl like me with an unquenchable thirst for nicotine. The nicotine hit is average but not huge at 7 mg, which is 1mg less than the usual 8mg dry white SM portions. Im starting to think that a lot of my needs for nicotine are based purely on a mental placebo. The larger the portion is, the more nicotine I ‘think’ I’m getting there for the better. Which I guess is why a lot of mini portions leave me wanting for more and contribute to a feeling of not being satisfied. So despite this not being a high hit product, I feel that I am getting enough nicotine because of the size and amount of tobacco in the pouch. The flavor is not my favorite. It’s not the best or cleanest mint on the market but is adequate enough and would be enjoyable to those who like a subtle mint and tobacco flavor. It does not have an artificial sweetener but it does have a slightly sweet aroma and taste which I think comes from the flavorings. It contains minimal ingredients and this to me is perfect, the less ingredients and processing the better as far as I’m concerned. 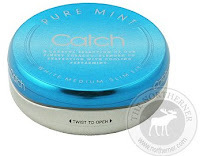 I always use this snus when I am out and about. I feel so stylish pulling the can out of my purse at a bar or restaurant, and it seems to compliment many alcoholic beverages. 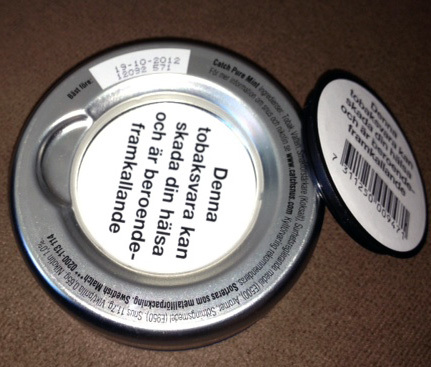 I would recommend this snus and I will continue to buy it, use it, and collect the cans!